Niko Henrichon is a Canadian comic book artist who has recently moved to France. He has done work for American publishers Marvel Comics, Dark Horse and DC/Vertigo, including Barnum! : In Secret Service to the USA with writers Howard Chaykin and David Tischman, and The Sandman Presents: Taller Tales with Bill Willingham and Spider-Man Fairy Tales. He is best known for his collaboration with writer Brian K. Vaughan on the graphic story Pride of Baghdad, art from which is currently on display in the LitGraphic: The World of the Graphic Novel exhibit at the Norman Rockwell Museum. Henrichon is a contributor to the second 24Seven comics anthology and worked with 24Seven creator Ivan Brandon for a five-issue arc of Machine Man that will run in Marvel Comics Presents starting with #8 this April. He is also a guest artist for Fables #70 from DC/Vertigo, and recently worked on a European project called Unleash. 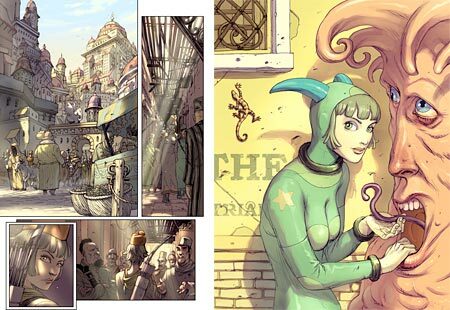 Henrichon also created Fantastico, a personal comics project, from which the images above were taken. His blog also serves as his web site, with three pages marked out for Illustrations, Comics and Sketchbook. You’ll also find many more pieces linked from smaller images in the blog posts themselves. Henrichon has a refreshingly open style that is somewhere between mainstream American comics and European comics, perhaps leaning to the European side; with fewer spotted blacks and less hatching than most mainstream American comics artists and an emphasis on defining form with color, but without heavy modeling. I find it hard to pin down, but there is something about the unassuming qualities of Henrichon’s work that I find particularly appealing, a sort of innocent charm in the way he delineates his figures. You get the feeling that his drawing style has evolved naturally out of drawing what he likes, and hasn’t been forced into a particular genre. Somehow, he impresses by not trying too hard to impress. That’s a refreshingly useful approach to an artist’s website, too. Every artist should have a blog, and it’s surprising how many go for the bloated and overcomplicated or sparse and unhelpful websites – without blogs – instead!